The mixture of shitake, oyster and cremini mushrooms bring complex flavor to traditional steak dinner. Heat oven to 425°F. Combine thyme and pepper; reserve 1 tablespoon for mushrooms. Press remaining seasoning mixture evenly onto all surfaces of beef roast. Place roast on rack in shallow roasting pan. Insert ovenproof meat thermometer so tip is centered in thickest part of beef, not resting in fat. Do not add water or cover. 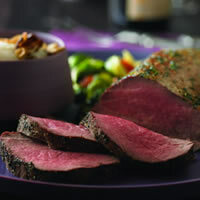 Roast in 425°F oven 35 to 40 minutes for medium rare; 45 to 50 minutes for medium doneness. Meanwhile melt butter in large nonstick skillet over medium heat. Add mushrooms and 1 tablespoon reserved seasoning; cook and stir about 7 minutes or until mushrooms are tender. Season with salt and pepper, as desired. Keep warm. Carve roast into slices. Serve over grits, as desired; top with mushrooms. Nutrition facts are calculated by a food expert using nutritional values provided by the USDA for common products used as recipe ingredients. Actual nutritional values may differ depending on the amounts or products used and can be affected by cooking methods. Read our healthy recipe definitions.